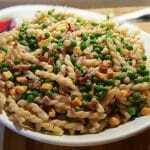 Crispy bacon, sharp cheddar cheese and homemade dressing make for a fresh and summery pasta salad studded with green peas. Add pasta, salt and water to Pressure Cooker cooking pot. When Beep sounds, allow a 1 minute Natural Pressure Release and then a Quick Release. When all pressure has been released, remove lid. **If using fresh peas, add them to the cooking pot prior to cooling off the pasta and allow them to blanche for 30 seconds. Remove cooking pot and pour in fresh cool water. Drain water from pasta and rinse until no longer hot. In a small bowl add mayonnaise, lemon juice, sugar, vinegar, Worcestershire sauce and whisk together. In a large bowl, add peas, cheese and bacon and pour in dressing. Gently mix together and then add pasta and combine. Allow Salad to marinate at least four hours in the refrigerator, or overnight. Ham, Roast Beef or Poached Chicken work well with this salad. Rule of thumb for cooking pasta - use 1/2 of the time (lower number) indicated on the package.